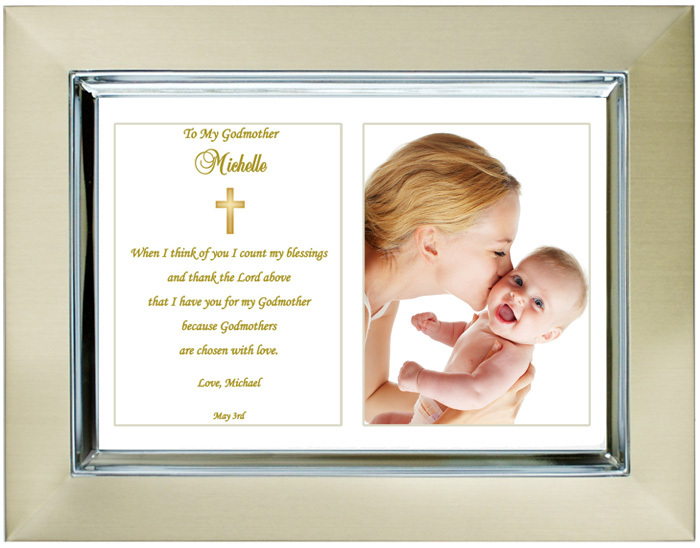 Here's a beautiful way to display a personalized poem from a Godchild to his or her Godmother. 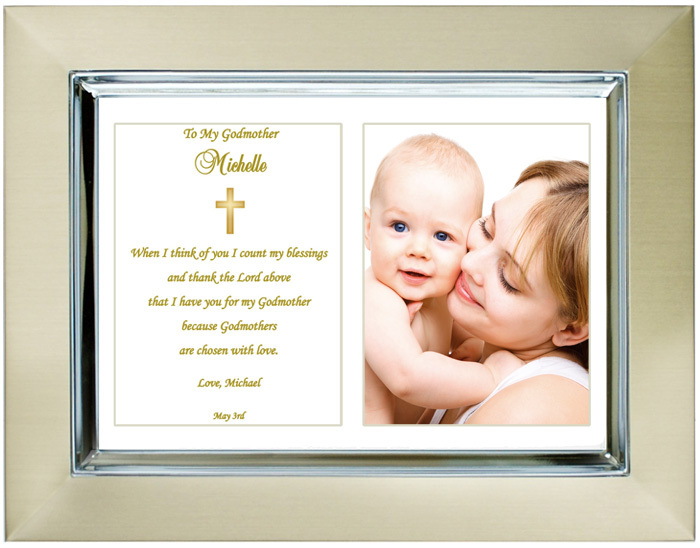 The sentimental personalized poem in an attractive 5x7 inch frame is a wonderful way to thank a Godmother on your child's baptism day. 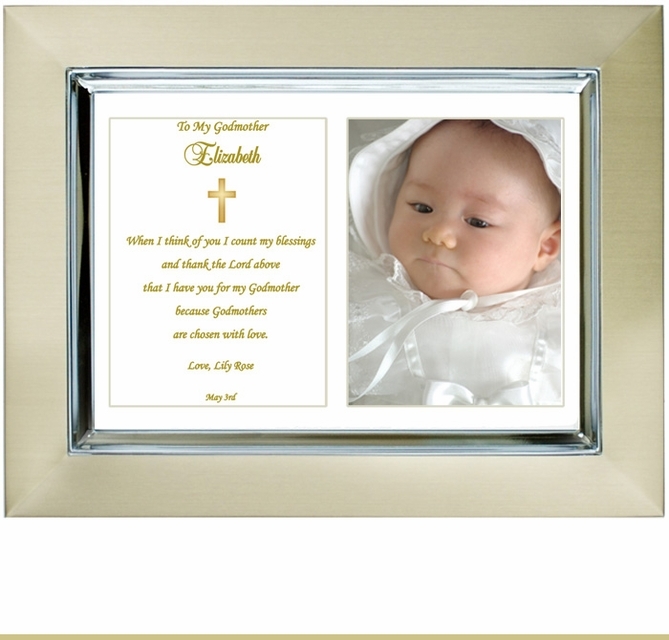 Attractive keepsake that can display a photo from the baptism or other important occasion. Makes a unique personalized baptism keepsake from the Godchild. Godmothers Are So Very Special! They are chosen with love because they will play a very important role in your child's life beginning with the baby's Christening Day and continuing as he or she grows. This is a beautiful gift for any Godmother. The loving poem is personalized and is enclosed in a 5x7 inch frame. A photograph of the baby and Godmother can be easily placed inside the frame by either you or the Godmother. 1. Optional Phrase above Name - Examples: To My Godmother; My Special Godmother; etc. 3. Closing Phrase and Godchild's Name - Examples: I Love You, Emily; God Bless You, Joshua Michael; etc. I loved it and would recommend this site to friends and family. My sister was my daughter's Godmother. Wanted to get her something extra special. She loves pink roses so this was the perfect gift. She cried when we gave it to her. Your website is accurate in depicting the very best customer service. I will not only use your site again to purchase gifts but I will recommend it to all of my friends. You were wonderful to deal with and again thank you for making sure my son's Godmother had her gift on the day of the baptism.